Pakistan have placed themselves in a comfortable position in the first Test by taking a first innings lead of 96 runs against England at stumps on the second day. England was bowled out on 192 runs in their first innings and Pakistan responded with 288 runs for the loss of seven wickets. Adnan Akmal was unbeaten on 24 runs and the new batsman has yet to appear on the crease. The match which is being staged at Dubai International Cricket Stadium, started on January 17, 2012. 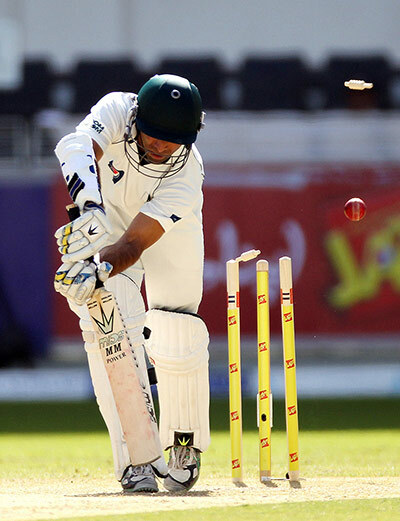 Pakistan scored 42 runs without losing any wicket at the close of the first day’s play. Mohammad Hafeez and Taufeeq Umar were unbeaten on 22 and 18 runs respectively in 15 overs. The openers started the second day with caution while utilising all loose balls which were dispatched to the boundary. The fifty of the innings was completed in the 18th over and England fast bowlers were unable to threat the batsmen who kept the score board moving at a substantial rate. Taufeeq opened his arms by dispatching consecutive fours in the 32nd over to Chris Tremlett and achieved his well deserved fifty. The century of the innings was completed in the very next over and Hafeez got his fifty in the 34th over. Hafeez got a life when he was dropped on the fourth ball of the 36th over by Tremlett off Stuart Broad on 52 runs but Taufeeq lost his wicket on the very next ball when he was bowled at 58 runs. The first wicket fell at 114 runs and Azhar Ali was the next victim after the addition of just 14 runs in the total. The experienced Younis Khan came in next and shared a partnership of 48runs for the second wicket before Hafeez lost his wicket at 88 runs. He was declared leg before wicket off Graeme Swann as the skipper Misbah-Ul-Haq walked in the centre and joined with Younis. The duo added 26 runs for the fourth wicket before Younis was gone after scoring 37 runs. The youngster Asad Shafiq remained unimpressive as he was the next batsman sent back to the pavilion after he scored 16 runs. Misbah and Adnan Akmal steadied the innings while negotiating the bowlers according to the merit and securing their wickets. Misbah achieved his fifty on the first ball of the 100th over but was declared lbw four overs later at 52 runs. The newcomer Abdur Rehman could not resist and went back to the pavilion in the very next over at four runs. 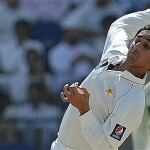 Adnan was doing well at 24 runs as the new batsman has yet to arrive at the crease when the day’s play was called off. Pakistan managed 288 runs after losing seven wickets and are enjoying a valuable first innings lead of 96 runs. James Andreson, Tremlett and Swann shared two wickets each as Trott claimed one wicket as well. Pakistan will try to enhance their lead in the third day while England will be anticipating their tail to fold quickly on the third day.